Meals and beverages upon request (extra charge). Not available at this property. No additional guest are allowed at this property. All canceled reservations received 8 or more days prior to arrival are subject to a 10% cancellation penalty. Reservations canceled within 7 days of the scheduled arrival date are subject to a 100% penalty and are responsible for the entire stay and will forfeit all payments. Pets are welcome at this property. The treehouse, which stands on a 50 m² platform among oak trees, has been built in an adventure park called Cadmos Village near Dubrovnik on Croatia’s southern Dalmatian coast. 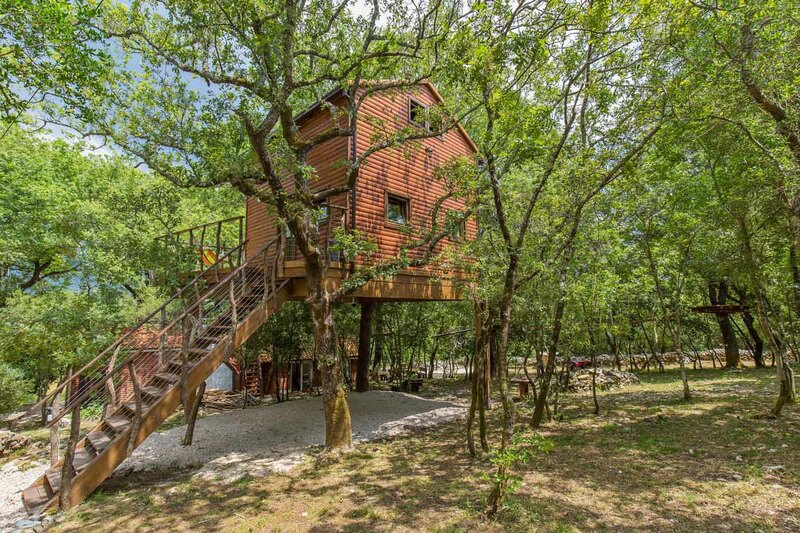 Treehouse at Cadmos Village is the first eco-friendly treehouse in Croatia. The treehouse which is powered by solar energy can accommodate up to 6 people who will enjoy fresh air, an open terrace and a beautiful view over Konavle valley. There is also a restaurant near the treehouse so guests can enjoy traditional, homemade local food. Guests will love the on-site activities such as a paintball field, giant swing, adventure course with 4 zip lines, bikes and archery field. The lovely eco-friendly solar powered treehouse boasts three rooms to roam around. There is an en-suite bathroom with a toilet and shower, a dining area, terrace and balcony. What to bring: cash, bug spray, sunscreen, sandals, and hiking boots. This unique property is a Directory Listing-only on GLAMPING.COM and is not participating in our availability messaging or booking program at this time.